So this week we are the beginning of our exploration of the sonnet, considered to be the workhorse of love poetry. The sonnet originated in Italy during the 12th century. However, the Italian Renaissance poets Dante and Petrarch were the ones who really popularized this poetic form. Their work in the sonnet form inspired that of early English sonneteers, Thomas Wyatt and Henry Howard who are considered to have written the first English sonnets. In England during the 16th century, the sonnet became the most popular form of poem to write, Poets, such as Sir Phillip Sydney, Edmund Spenser, Lady Mary Wroth, wrote long sonnet sequences that would often tell the story of an unrequited lover’s desperate pleas to the object of their affections. By the time (he writes them around 1593 and publishes them in1609) Shakespeare writes his sonnets, of which there are 154, the sonnet tradition was waning. 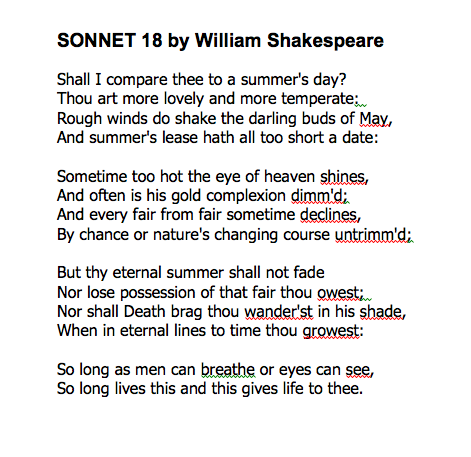 However, Shakespeare revitalizes the sonnet form, making it uniquely English. (Hence why a Shakespearean sonnet is also known as a English sonnet.) For the past nine hundred, the sonnet has become the most recognizable form of poem. Instead of the Petrarchan sonnet of a octave followed by a sestet, Shakespeare gives us three quatrains, four lines of verse grouped together by a rhyme sequence, and a concluding couplet. Rhythm: Shakespeare gives us blank verse! No only did Shakespeare introduce a new rhyme sequence to the sonnet form but also a new rhythm. Remember that the sonnet is originally Italian, and the early sonneteers mainly just copied the Italian sonnet form. It was Shakespeare who made the sonnet truly English. One of the ways he accomplished this feat was by introducing iambic pentameter lines to the sonnet. Probably the best way to understand what iambic pentameter is is by defining each word separately. So what is an iamb? When you attempt to scan, or analyze the rhythm of a line of poetry, you will look for patterns of stressed and unstressed syllables. Generally, you can group syllables by a repeating pattern of stressed and unstressed. Here’s what the first line of Sonnet 18 looks like scanned (the stressed syllables are italicized): “Shall I com pare thee to a sum mer’s day.” Notice how the pattern repeated is unstressed followed by stressed. This grouping of syllables, also known as a foot , is known as an iamb. An iamb is the most common foot of poetry in English. In writing this blog post, I came across this youtube clip of a younger girl, Chloe Louise, who actually raps Sonnet 18 following the iambic rhythm. See if you can hear the iambic pentameter. Here’s a link to a website that shows you how to scan a line poetry in 11 steps. I think you’ll find it very helpful. This entry was posted in Uncategorized and tagged couplet, iambic pentameter, meter, octave, poetry, quatrain, rhyme, scansion, sestet, Shakespeare, sonnet, Sonnet 18, volta. Bookmark the permalink.